It was Sunday morning, and it was raining. Not just any kind of rain… it was that sneaky, endemically Irish drizzle that saturates you before you realise you’re getting wet. It was misery incarnate. Miserable or not, we had a job to do. I grabbed the gear, threw it in the car and off we went. We only had a quarter of an hour drive to the small inlet on the West Cork coast. Walking down the foreshore I could see the body down near the water. The incoming tide lapped gently around it, moving it ever so slightly, making it look almost alive. It was a harbour porpoise — the smallest of Ireland’s 24 cetacean species (whales, dolphins and porpoises). Watching cetaceans from a boat, from the mighty fin whale to the diminutive harbour porpoise, is always a thrilling experience. Alive and vital there’s something tremendously compelling about marine mammals. They have a sort of oceanic “ahhh” factor that affords them almost universal appeal. Some of my most memorable wildlife moments have been encounters with whales and dolphins around the world… and the best of them have been right here in Ireland. Coming face-to-face with a dead cetacean is different. More sombre, perhaps; less exhilarating, certainly, but still an unforgettable experience. 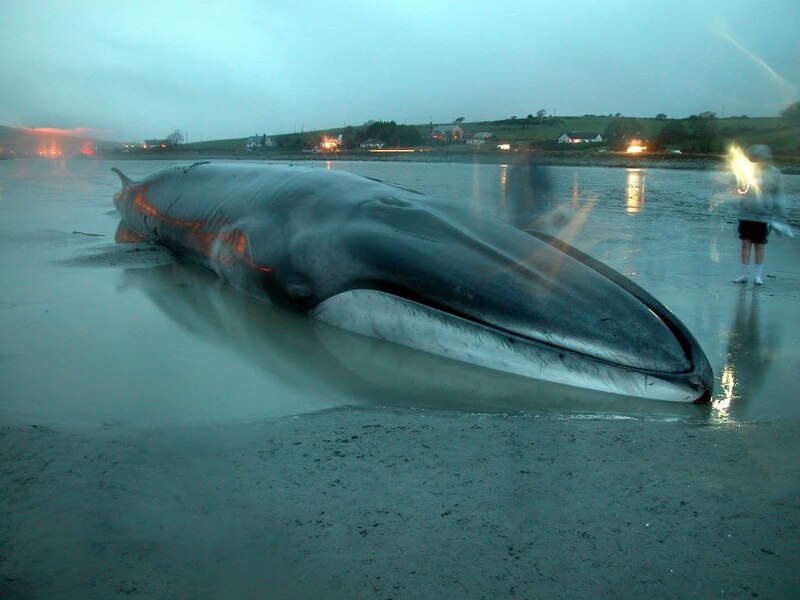 I remember walking around a fin whale that stranded in Courtmacsherry harbour in January 2009 and being humbled and awed by the sheer size and presence of the magnificent creature. When you see fin whales from a boat you never truly appreciate their massive bulk; most of the animal remains unseen beneath the surface. The fin whale is the second biggest animal ever to have lived on earth — bigger than any dinosaur. Only blue whales grow bigger. Seeing a 20 metre long, 50 tonne fin whale sitting on the sand, being able to walk around it, offered a sense of perspective and scale that simply isn’t possible from a boat. It was the same thing with the porpoise, albeit on a much smaller scale. Porpoises are notoriously boat shy, so when you see them it’s invariable fleeting glimpses of their small dorsal fin, a brief view of an arching back, and they’re gone. Seeing the whole animal out of the water for the first time was a fascinating and memorable experience. Armed with my Irish Whale and Dolphin Group (IWDG) stranding kit I felt like someone from CSI approaching a crime scene. With my eight-year-old daughter lending a helping hand, I proceeded to take a series of measurements, photographs and two small tissue samples to add to the growing body of stranding data that the IWDG has been gathering since 1991. Our porpoise was a 1.78 metre long adult female. It had been reported to the IWDG two days earlier, and as the nearest IWDG stranding network volunteer I was contacted and asked to take a look. It was a fresh stranding of an animal not long dead: she had some scarring along her flanks and possible rake marks (teeth marks) and scarring on her dorsal fin. There were also a few lesions where gulls and other scavengers had been picking at the carcass — but apart from that she looked pretty much as she would have done when she was alive. I was wondering at the wisdom of bringing a youngster along to a stranding but my daughter was enthralled by the whole process. I’m sure it’s something she’ll always remember, and it’s healthy for children to realise that nature is about death as well as life. Why go to the trouble of measuring dead cetaceans you might ask? 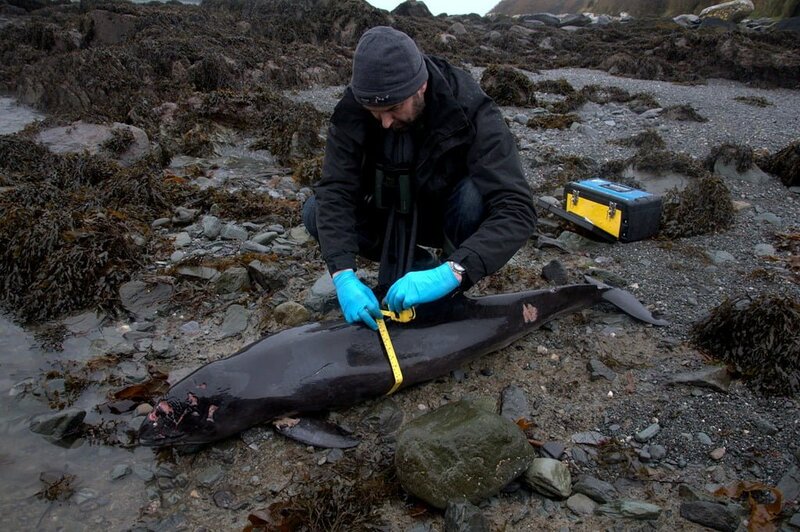 Well, the collective information held in the IWDG’s stranding database allows scientists and conservationists to monitor the mortality and distribution of cetaceans around Ireland’s coast. That information helps them to make informed choices about effective cetacean conservation. It also provides a valuable baseline of “normal” cetacean stranding levels around the country, throwing anomalies into stark relief and highlighting potential problems early. Taking measurements and samples from dead animals might seem a bit of a grim pastime, but it’s absolutely worth doing. It’s heartening to think that information gleaned through death is ultimately, helping secure the future of animals that are still alive. Adding to that body of knowledge, even in a small way, is a real privilege. Find out more about the IWDG stranding scheme, and search and browse stranding records from around Ireland, on www.iwdg.ie. First published in the “Natural World” column of the Irish Independent’s Weekend Magazine on Saturday 17 March 2012, where an enterprising sub-editor gave it the title “CSI: Seaside”.